My curry of choice is always the rogan josh. It’s solid and dependable, the backbone of Indian cookery, unpretentious, hot but not overpowering, deeply flavoured and intense. It’s a proper curry. I’ve made variations on the rogan josh with chicken, lamb, mutton and the decidedly unauthentic and borderline sacrilegious beef. Each produces a different result, a completely different dish using the same base spices and ingredients, but of them all, the best is made with lamb or mutton. The rogan josh is a Kashmiri dish, and has all the hallmarks of food from that area – rich and aromatic, deep and flavoursome. There are a couple of schools of thought about the meaning of the name. The first is that it’s derived from the Persian words for clarified butter, ‘rogan’, and hot or passionate, ‘josh’. The second interpretation is that ‘rogan’ is the Kashmiri word for ‘red’ and ‘josh’ derives from the word ‘gosht’, which as every seasoned Indian food aficionado knows, means lamb. The second explanation seems more plausible, but the first is more romantic, so I’ll go with that. 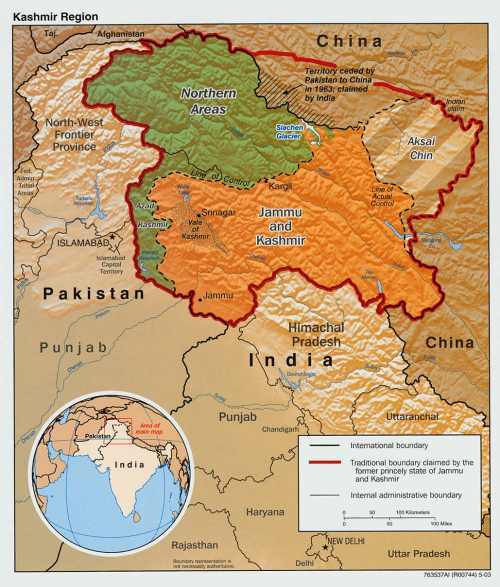 Kashmir itself straddles India, Pakistan and China. It’s perhaps no surprise that it has a tense and torturous history of conflict, which continues today. India claims sovereignty over the entire area, and refuses to acknowledge the area administered by Pakistan, or the area ceded by Pakistan to the Chinese. The British Foreign Office still advises against traveling to large parts of Kashmir. Despite the politics and danger, the food is excellent, and rogan josh is a classic example. Brown about a kilo of lamb or mutton shoulder in batches in a large pan. Use oil, or better still, ghee. Boned meat produces an easier dish to eat, but using meat on the bone adds a huge amount of flavour. Eating it is a messy business, but it’s worth it. Meanwhile, blitz a roughly chopped onion, an inch of fresh ginger and eight cloves of garlic in a blender, with a little water added to get things moving. When the meat has been browned, add a couple of bay leaves, ten black peppercorns, ten whole cardamom pods, six cloves and a stick of cinnamon to the pan with another glug of oil or a chunk of ghee, if necessary. Allow the spices to fry gently for a few seconds before adding a finely chopped onion. Stir and fry until the onion takes on come colour. Add the pureed onion, garlic and ginger mix to the pan and scrape all the goodness from the bottom of the pan. Add a teaspoon of ground coriander seeds, two teaspoons of ground cumin seeds, four teaspoons of bright red paprika and as much cayenne pepper as you can stand. Start with a little over a third of a teaspoon and work upwards from there. A teaspoon of salt is also needed. Stir and fry gently for about five minutes. Add the browned meat back into the pan, along with any juices that may have been left behind. Stir thoroughly so that the meat is well coated in the onion and spice mix. Add yoghurt, one tablespoon at a time, six or seven tablespoons in total, stirring each spoonful in to make a rich and creamy sauce. Top the pan up with some hot water, so that the meat is covered and allow to bubble away for an hour or so with a lid on. For the last twenty minutes, remove the lid and allow the sauce to reduce, increasing the heat if necessary. Finish with a good sprinkling of garam masala and a twist or two of ground black pepper just before serving. Eat with plain boiled rice, a naan bread and a decent glass of beer. Note: map courtesy of the CIA. Yikes! 4 out of 5 – better than most other recipes, but could do with more chili! …add as much chilli as you can stand! Nice recipe but I can’t help myself pointing out that gosht has only come to be thought of as meaning lamb, it actually means meat, but more generally meat acceptable to curry use (i.e not pork or beef), mainly goat and lamb. True, but there are many variations on this. In general, in Britain, ‘gosht’ normally means lamb or mutton. This isn’t the same elsewhere, and you’re right, it means any meat good for curry in a lot of places. 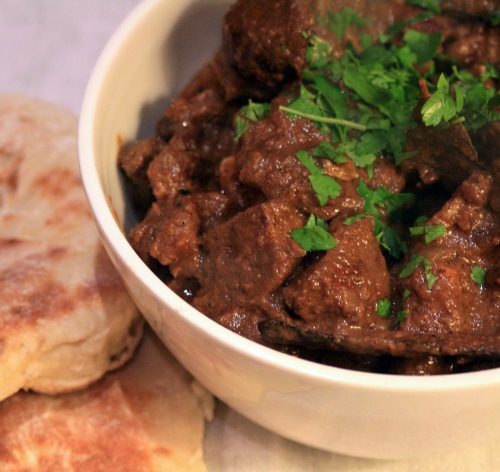 Try this recipe with goat….it’s incredible.